Although spot naphtha prices in both Asia and Europe have stepped back somewhat from their early September highs, prices remain close to the 2013 highs recorded in mid-February, as per the pricing service of ChemOrbis. Players are anticipating a firm year end trend in the Asian market while demand in Europe is said to be sluggish. In Asia, players commented that the outlook for the coming months is firm even though spot prices on a CFR Japan basis have retreated somewhat from their early September highs as reduced geopolitical tensions over Syria have caused crude oil prices to ease.Traders commented that naphtha prices are likely to remain firm in Asia during the last few months of the year as traditionally strong demand during the lead up to Christmas and the Chinese New Year will face of period of reduced availability from the West as several European refineries will undergo scheduled maintenance towards the end of the year. Some players expressed concern that reduced availability from Europe might create shortages in the Asian market similar to those seen earlier this year when spot naphtha prices reached their 2013 highs. In addition, players commented that demand from crackers will remain strong as alternative feedstock such as LPG are not said to be competitive. 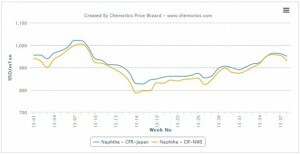 In Europe, arbitrage opportunities to Asia remained the primary support for naphtha demand as buying interest within the region was described as muted, according to ChemOrbis. Demand from cracker operators is being hurt by competition from propane while demand from the gasoline sector was said to be disappointing even though naphtha usage for gasoline production typically increases in the winter.